Gas /Steam Flow Meter is most suitable for measuring compressed air consumption, Biogas & LPG consumption in various industries. 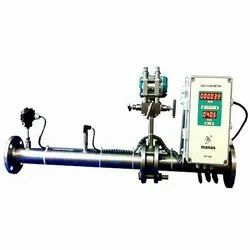 The GFMc-150 flow meter is applicable for measuring flow rates of Bio-gas, LPG, Compressed air and other compressed gases in closed conduits. It is best suited for applications where affordability, reliability and ruggedness are of prime concerns. In conventional system of measurement, the differential pressure generated by orifice plate is measured by DP transmitter. The output from DP transmitter after square rooting is accepted as proportional to flow rate. This assumption is true only when the density is constant. Unfortunately density of compressible fluid is never constant. The density of compressible fluid changes with line pressure and line temperature. Thus, introducing errors in flow rate measurement. Installation Easy to install Critical & expensive because of Requirement of special machined pipe lengths. Existing pipeline modifications for installation No modifications required. Design is based on velocity & not on line size. As a result customer line size & selected flow meter size may differ. 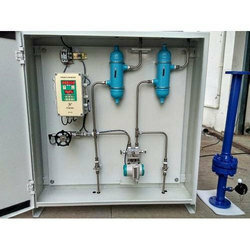 GFM series flow meter for measuring flow rates of Bio Gas, LPG, compressed air, steam (saturated & superheated) in closed pipes. Compact Steam Flow Meter is based on the principle of differential pressure generated by Orifice element. On line density compensation delivers very accurate results. Various Types of IBR/Non-IBR valves for isolation and drain. Various Sizes of Orifice Assemblies with or without IBR Certificate. Complete System is Engineered to suit your requirements. Highly Reliable and Repeatable System; No Moving Parts. The SFMc-150 flow meter is applicable for measuring flow rates of saturated and superheated steam, mass flow rates of Boiler feed Water in closed conduits. It can be used as heat energy transfer meter to measure thermal energy using various fluids which are being used as the heat transfer medium. In the conventional system of measurement, the differential pressure generated by orifice plate is measured by DP transmitter. This assumption is true only when the density is constant. Unfortunately, the density of the compressible fluid is never constant. Installation Easy to install Critical & expensive because of Requirement of specially machined pipe lengths. Existing pipeline modifications for installation No modifications required. The design is based on velocity & not on line size. As a result, customer line size & selected flow meter size may differ. 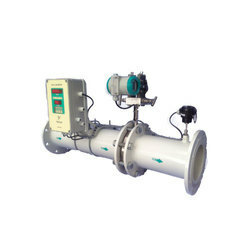 An Orifice Flow Meter is basically a type of flow meter used to measure the rate of flow of Gas, Steam or liquid, using the Differential Pressure Measurement principle. ... When this Orifice Plate is placed in a line, a differential pressure is developed across the Orifice Plate. Suitable for all type of Gas like Biogas, LPG, CNG, PNG, Air, Oxygen, Nitrogen, Saturated and Superheated Steam, Condensate water, HOT water,Thermic Fluid THERMINOL 55, THERMINOL 66, THERMINOL 72 WATER, THERMIA A , THERMIA B. Looking for Orifice Based Gas and Steam Flow Meter ?